With less than a week to go to Cop 18 the, UN’s climate talks the past week have seen several sombre climate news announced. Last week, a report published by the International Energy Agency (IEA), that highlighted the increasing dominance of subsidies in the fossil fuel industry, which in 2011 jumped by almost 30% to $523 billion. By 2015, the US will be the world’s biggest gas market, and by 2017, it will be the world’s biggest oil market, all indicating that Obama’s strategy to make the US energy independent is on track. And more depressingly, it also shows that even though the US itself is becoming less reliant on oil, global demand is set to rise to 31% due to development in China and India. On a more positive note however, the report projected that by 2015, which is only three years from now, renewables will be the second largest energy source in the world. This week another saw set of sombre climate news as it was announced that CO2 emissions hit a new record high in 2011, which means that they now measure a global average of 390.9 parts per million (PPM) – in some parts of the world that number will be higher and other parts lower. In the Arctic, where the concentration of CO2 is at it’s highest, it reached an extraordinary height of 400 PPM this summer. Global coal consumption reached 7,238 million tonnes in 2010. 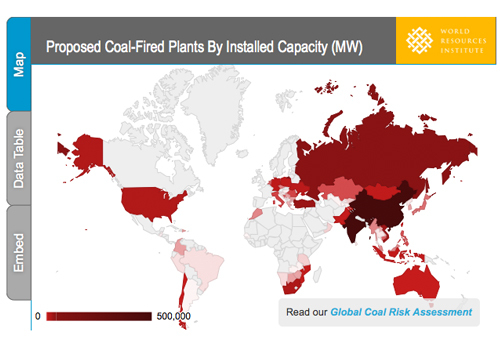 1,199 new coal-fired plants, with a total installed capacity of 1,401,278 megawatts (MW), are being proposed globally. 483 power companies have proposed new coal-fired plants. The “Big Five” Chinese power companies (Datang, Huaneng, Guodian, Huadian, and China Power Investment) are the world’s biggest coal-fired power producers, and are among the top developers of proposed new coal-fired plants. Chinese, German, and Indian power companies are notably increasingly active in transnational coal-fired project development. Australia is proposing to increase new mine and new port capacity up to 900 million tonnes per annum (Mtpa) — three times its current coal export capacity. Map of proposed coal-fired power plants. Standing out in that list is Morocco’s proposal for a coal-fired power plant. Morocco is a country with massive solar PV potential, it is the base of the Desertec Foundation project and has no coal reserves, meaning that if their proposal is approved, they would have to import all of the coal. Another startling fact is that, due to the growing global coal market, coal rich Australia is looking to TRIPLE its export. To put the report into context, there is no doubt that the majority of these proposals are due to the emerging demand of economies in China, India and other developing countries, but it’s also worth bearing in mind that some of the proposals are based upon that some of the existing plants coming offline.